When you’re building a business based on recurring revenue, what you want is predictability. The “recurring” part is a pretty strong measure of that, but getting more of that recurring payment upfront reduces churn and improves cashflow, letting you spend more money now to acquire customers faster. Most companies are very low-touch with annual plans. It’s offered as an option on pricing pages, and that’s usually where it’s left. But you can drastically improve conversions to annual plans by having a slightly higher touch. What we see a lot of companies do is a once-a-year email push in the fourth quarter to try and squeeze out a single influx of cash. We took this a step further and started sending out emails within a few months of a company signing up. Subject: Baremetrics pricing change for annual switch? Hey Sally! We’ve been testing out some new pricing models for Baremetrics and instead of our usual 2-months free for switching to annual pricing, we’re offering 3-months for free to a subset of customers. Reply and let me know and I can add the right coupon to your account and make the switch to annual for you. This worked relatively well, getting us $14,000 in 7 days. But we found the emails didn’t get the response rate and, more importantly, the conversion rates that we believed we could be getting. So, we did a little experiment. 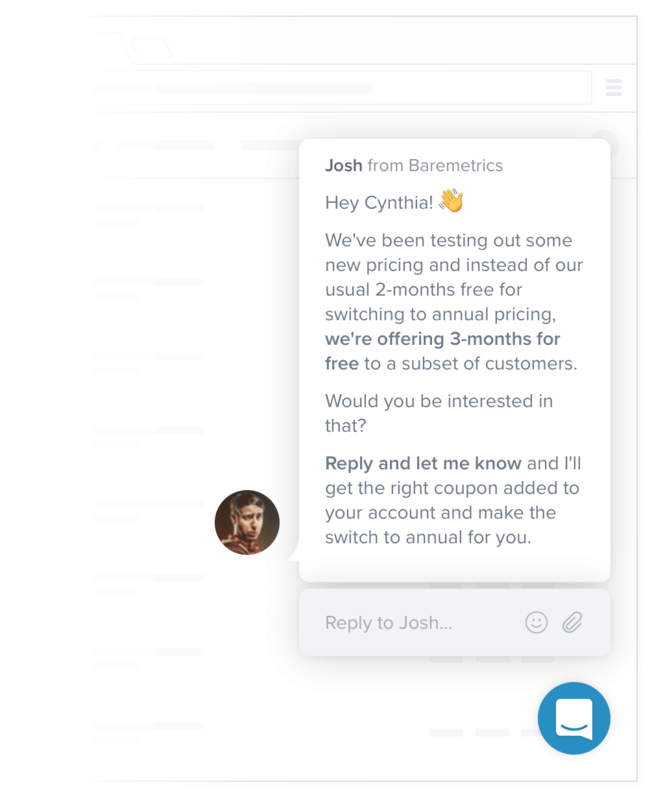 We’ve increasingly been moving the ways that way converse with our active customers out of email and into in-app messages (courtesy of our pals at Intercom). We’ve found those message get a much higher response rate and the quality of the response is generally higher. We decided it’d be worth testing moving these annual upsells to in-app messages as well. It’s the same offer to the same people, just in a different format. The result? We saw a 30% increase to annual plans. 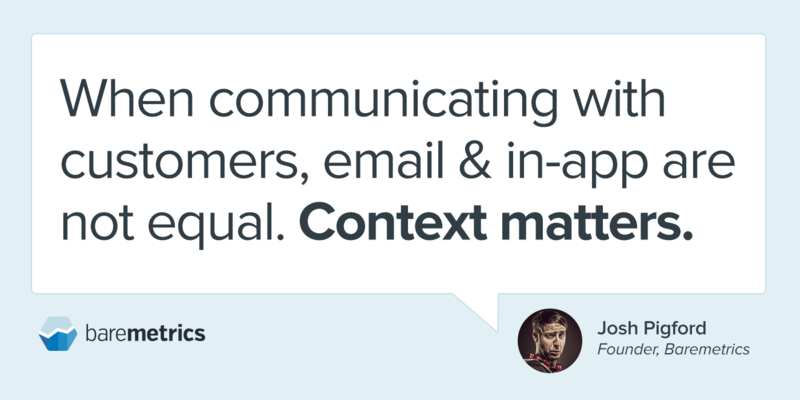 What we’ve learned as we transition a lot of customer interactions to in-app messages is that context matters. And I believe that applies strongly here. With an in-app message, the annual offer is present right smack in the middle of the user soaking up the value they get from Baremetrics. When a message is presented in a value context, it changes the customer’s sentiment towards the action requested. User looks through metrics, growth, breakouts, trends, etc. User scoffs and hits “delete”. The “cloud of value” they’re surrounded with while inside Baremetrics does not exist in their inbox. It’s also more work to take advantage of the offer and feels weird to reply to an email to upgrade to something (in many cases spending thousands of dollars). So, whether it’s annual upsells, feedback or feature education, try changing the context of the message to see if the relevant conversion rates are improved. For us, it’s been a consistent improvement for all types of messaging. What are some ways you’ve improved annual upsell conversions?